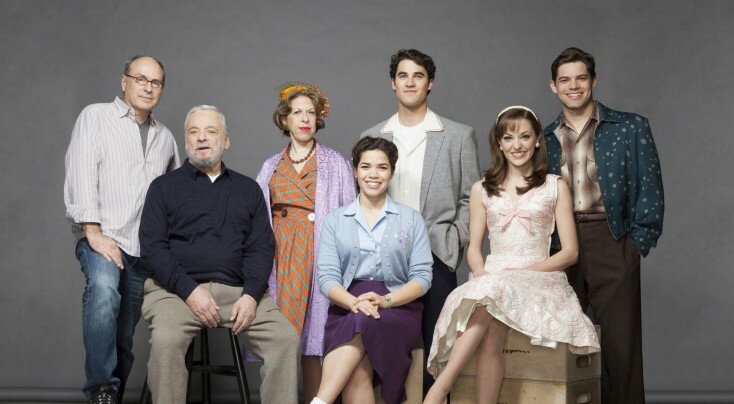 (l-r) James Lapine, Darren Criss and America Ferrera in the documentary “Six By Sondheim.” ©HBO. CR: Matthu Placek. Don’t let the title fool you. Although the new feature-length documentary “Six by Sondheim” devotes special attention to a mere half-dozen of the acclaimed lyricist/composer’s songs, it also provides a fascinating look at Stephen Sondheim’s entire more than half-century career. It airs on HBO, Monday, Dec. 9 at 9 p.m. ET/PT. Sondheim is featured in interview footage dating back to his 1950s beginnings, affectionately recounting everything from his early collaborations with Leonard Bernstein (“West Side Story”) and Jule Styne (“Gypsy”) to the great debt he owes family friend and de facto mentor Oscar Hammerstein II. More recently, the Oscar, Pulitzer Prize and multiple Tony Award winner enthusiastically talks about the pleasure he takes in teaching as a way of passing on what he has learned from a lifetime of experience, such as when he guides a young singer through the nuances of a “Sweeney Todd” ballad. Three-time Tony Award winner James Lapine, who collaborated as director and librettist with Sondheim on the musicals “Into the Woods,” “Sunday in the Park with George” and “Passions” (in addition to directing the 2010 musical revue “Sondheim on Sondheim”), does an artful job here of assembling clips from numerous talk shows and personal appearances by his subject into a chronologically cohesive narrative. Old photos are invigorated by getting the multi-plane treatment, and a visual effect that appears to create the Seurat pointillist painting at the heart of “Sunday in the Park With George” dot-by-dot is a delight. The documentary features new performances of three of the title’s six songs by Audra McDonald (“Send in the Clowns” from “A Little Night Music”); America Ferrera, Jeremy Jordan, Darren Criss and Sondheim himself (“Opening Doors” from “Merrily We Roll Along”); and Jarvis Cocker (“I’m Still Here” from “Follies”). With this interesting, informative and thoroughly entertaining portrait of one of America’s most celebrated self-proclaimed “Broadway babies,” the defense rests.